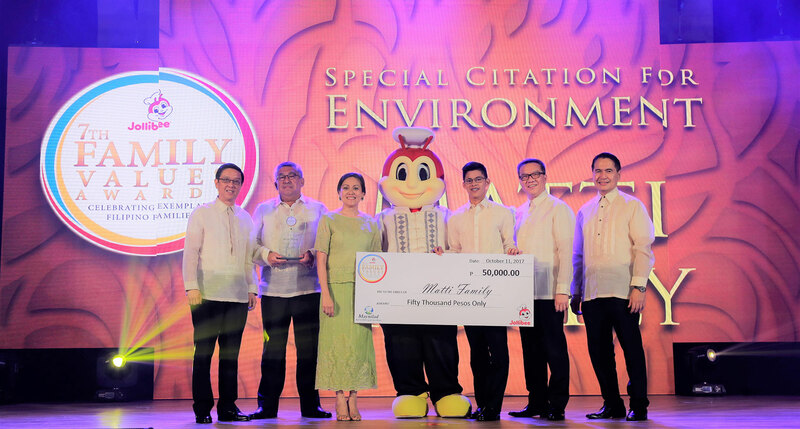 Jollibee Food Corporation awarded 6 hero families and gave special citations to three other families during the 7th Jollibee Family Values Awards (JFVA). The families were “recognized for their selfless dedication towards creating a positive impact in their communities through various advocacies” after months-long search for outstanding Filipino families in the Philippines and around the world. Juvenal and Erlin Castro and family of San Jose, California, named as Jollibee-Coca-Cola OFW Family of the Year, for breaking boundaries in bringing books and educational materials to Filipino children. Aside from being recognized as 7th JFVA winners, the Matti family was also awarded with the Special Citation for Environment (co-presented with Maynilad). The winning families each received a P300,000 cash prize, a brass trophy by sculptor Michael Cacnio, and P10,000 worth of Jollibee gift certificates. The special citation recipients were each given P50,000 in cash, a plaque, and P3,000 worth of Jollibee gift certificates. “Recognizing these families is more than applauding them for what they have contributed in nation building, but for the positive impact of their advocacies in our society and for future generations. For Jollibee, the Filipino family is at the core of the brand, and we remain committed in reinforcing and in promoting these values we hold dear,” said Jollibee Philippines President JJ Alano. The 9 hero families were chosen from among 15 finalists reviewed by a selection committee co-chaired by Senator Sonny Angara and Ateneo de Manila President Fr. Jett Villarin.